The Samsung TV SDK Team is pleased to release the Tizen-based Samsung TV SDK 1.0. The SDK provides developers with the tools they need to begin developing for the Tizen-based Samsung TV platform. The toolset includes an Integrated Development Environment (IDE) and a Web Simulator for testing TV apps on a PC. A Tizen-based Samsung TV SDK combines the best features of a TV with the power of web based technologies. By combining the size, input, and multimedia benefits of a TV with the connectivity features of the internet, developers can create innovative new experiences for their users. For overall information about Tizen App development, please refer to the http://developer.tizen.org Web site. 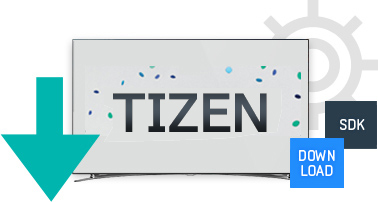 ■ Requirements for Installing Tizen-based Samsung TV SDK 1.0. 1) Tizen-based Samsung TV SDK 1.0 IDE requires Java Standard Edition (Java SE) version 1.7 or higher. 2) Tizen-based Samsung TV SDK 1.0 Web Simulator HLS play feature requires Adobe Shockwave Player and Adobe Flash Player. HLS play supported only in Windows and Mac OS. ■ Installation troubleshooting guide of Mac OS. If there are problems installing with the .app file of .dmg, please install via the .bin file in the terminal.